One of the most memorable moments of my trip to New Orleans last year was stumbling upon Candy Chang’s “Before I Die” wall during a bike tour. Last week Ted featured a speech by the NOLA artist recorded this summer. It is a touching self portrait of the artist sharing the sentiment behind an introspective piece that allows a community to empower itself by using a public space as a mirror reflecting the community’s inhabitants. A powerful voice emerges that both enlightens and bonds contributors via the shared experience of exposing your psyche. For me, consuming and digesting art is largely an introspective activity, but what’s fascinating about this particular work is that participating in the piece requires you to momentarily bare your soul to the public. These deeply personal moments are captured publicly yet are memorialized temporarily with a resonance that lingers far beyond the lines of chalk. 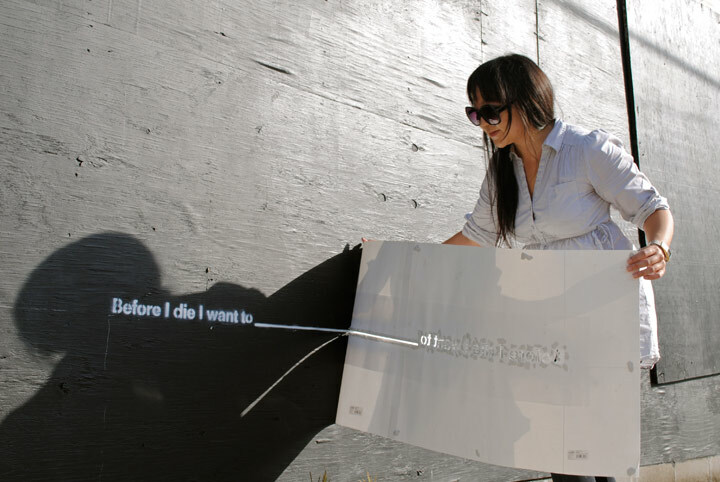 I love this project and would love to see it in every town…Candy Change is a true messenger! wow sounds incredible! i love ted talks!